A new baby brings joy to a family. And with each birthday, we celebrate the growth of children as we look to their future. How can we best prepare them for the wonder, the workforce and the world ahead? Today, First 5 LA celebrated its 20th year since voters chose to support our youngest Californians. Like many happy families, we gathered to celebrate the accomplishments of our agency and affirmed our goal for the years to come: by 2028, all children in L.A. County will enter kindergarten ready to succeed in school and life. How do we get there? For the past two decades, First 5 LA has worked to improve services, systems and policies for our youngest Californians and their families. Since its inception, First 5 LA has invested more than $2.2 billion in children from prenatal through age 5 to help thousands of children thrive and make sure that our systems help hundreds of thousands thrive as well. We are partnering with schools to create a Kindergarten Readiness Assessment that will soon measure how prepared our kids are to succeed in kindergarten, and we are supporting the use of tools to make sure that children who may suffer from developmental delays don’t fall through the cracks. We’ve strengthened home visiting services, supported expecting mothers through our free Welcome Baby program, and created the Children’s Dental Care Program, which has provided services to 125,000 children. Even as we share our joy, we recognize that change is never static and change agents cannot be complacent. Rather, we are a part of an ongoing conversation that depends on and is improved by the voices of an entire community. Today, we welcomed a whole cadre of thought leaders — from philanthropy, education, policy, business, higher education, cities, nonprofits, civil rights, community groups and journalism — to lend their perspectives to the issues that affect our children the most. Next week, we will celebrate with parents in our Best Start communities, parents who are leading policy and systems changes to support kids to be ready for school. How do we level the playing field for low-income families? How are children impacted by changes in education and employment? How can we include more business leaders and legislators in our shared goals for children? And can we work in partnership to move from broad big-picture objectives into smaller, targeted outcomes and concrete results for our kids? 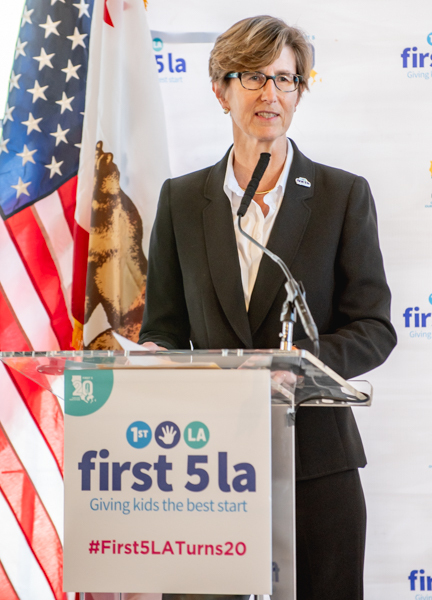 Since joining First 5 LA nearly six years ago, I have advocated for and been inspired by this organization’s drive to support the social determinants of child well-being and address root causes of childhood inequity. In 2014, our Commission adopted a strategy for deeper, longer-term impact by broadening our approach to solutions beyond direct services. By emphasizing prevention in health, family strengthening, community building and quality early learning — and by targeting policy and systems change-focused solutions — we have been able to implement changes that affect the most children. Implementing these changes is urgent. Our youngest children do not have the luxury of time. Ninety percent of brain development occurs during the first five years of a child’s life, and early childhood experiences have a profound impact on a child’s long-term development. Every child deserves to have a happy birthday — one filled with joy for the progress they’ve made and hope for the future that lies before them. But to ensure this for all of our youngest Angelenos, we need your support and your collaboration. 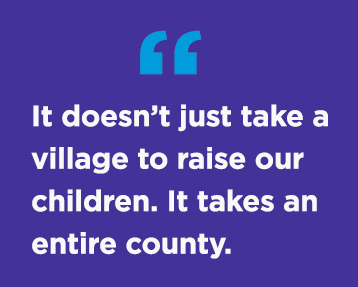 It doesn’t just take a village to raise our children. It takes an entire county. If you’ve already committed yourself to the well-being of our youngest, we thank you from the bottom of our hearts. But if you are just learning about the importance of the early years, and you’re a policymaker or the head of an organization or further afield from our work, we urge you to consider how your priorities would be enriched by strong children and families to power your work. On the day of our celebration, we want you to know that we are grateful for your partnership. You motivate us to keep reaching; we know that by partnering with parents, organizations, businesses, county agencies, and government officials, our North Star for L.A. County’s children is within reach.